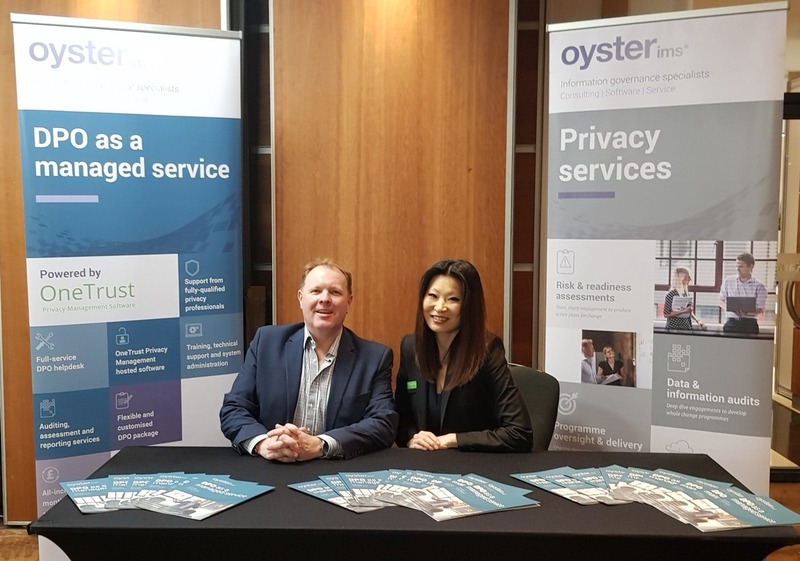 Oyster IMS spent a very enjoyable couple of days at the ExCeL Centre in London Docklands sponsoring the inaugural Data Protection World Forum. The event was a combination of multiple conference tracks and a wide-ranging supplier exhibition and was very well attended. The quality of the conference was very good indeed and each track was consistent and well curated. Several of the sessions proved very interesting but as always Stewart Room of PwC Legal stood out with his analysis and description of “The Journey to Code” – by which he meant the inevitability that privacy best practice will be baked into the way we do things in future, because compliance has to be about more than just about education and enforcement. I also thoroughly enjoyed several of the panel sessions especially the ones that resulted in a full and frank discussions, as they say. For our part, we had a nicely positioned stand offering our snappily titled “DPO as a Managed Service powered by OneTrust“ alongside our regular offerings such as Risk and Readiness Assessment, Information Audits, and our range of information governance software offerings around file analytics and document and records management. As an exhibitor, the staggered session times were actually a great help the exhibition floor was busy at all times and there was certainly an array of interesting exhibitors covering all aspects of data protection from cyber solutions to legal training. My only gripes would be that those staggered start and finish times caused a few clashes in attending all the sessions on my list and a little too much noise pollution due to the proximity of the theatres and the buzz of the exhibition hall. The stand was very busy on both days and it was great meeting plenty of new people and catching up with some friends of Oyster IMS such as Richard O’Brien from Records Transformation, Tim Judkins from The King’s Fund, Brett Taylor of Secure Business Computing Solutions and David Francis and Harrison Barrett from Canopius. All in all a promising start for an event that was a cut above many of the other events and has a chance of becoming a regular fixture on the event calendar. I hear the next one is in Singapore!